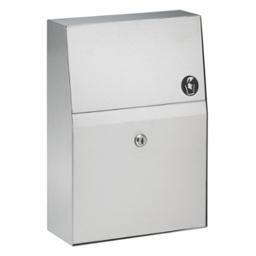 Bradley Stainless Steel Napkin Disposal Container is an attractive way to limit the mess in your toilet compartments and protect your plumbing from the clogs that occur when feminine products are flushed instead of thrown away. Has a placarded to signify the purpose of the unit. A keyed tumbler lock is included in the design of the unit to cut down on the risk of vandalism. this is for an end unit, to be surface mounted.